Take a Peek at the Insider’s Guide to Connections 2014! Click to get your guide! We all know that going to conferences can be stressful, and making preparations intimidating . With so many variables, from travel arrangements to attending sessions, meeting with clients or just finding time to eat and exercise, you have to be sure to plan for as much as you can, and be prepared to adapt as things happen along the way. We put together the Connections 2014: Insider’s Guide to help with just that–because if you wait until you’re there to start deciding what to do, more likely than not you’ll end up stressed out and accomplishing less than you had hoped. Hosted by the Salesforce ExactTarget Marketing Cloud, Connections is the definitive digital marketing conference, so you’ll want to make sure you do it right! And September 23-25 is coming up fast, so get your free copy of the Insider’s Guide, and you’ll be well on your way to making this year’s Connections conference one to remember! reach out to them before the conference to get a time on the calendar. casual attire with some comfortable kicks. Going to conferences can be stressful and intimidating. 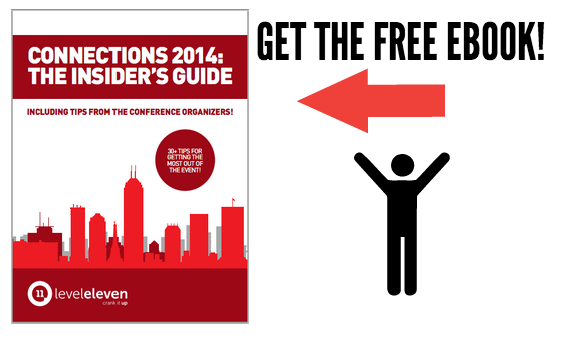 Get your copy of the Connections 2014 Insider's Guide and maximize your conference experience!